No space stations as yet, oh well. "We'll bomb those bastards like bastards have never been bombed!" Maybe Draal is veiling it? 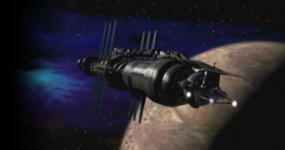 Astronomers then observed the mission and picked through infrared data about the star, which also featured in Babylon 5. That is quite fascinating, and what a nod to B5 in a science article. WOW! Shot a chill right up my spine reading that. I am telling you Babylon 5 fans are finally starting to influence society. Jan knows what I am talking about. But yes that is incredible. I LOVE that someone actually took the time to drop the B5 reference in. Well, yea. When the Great Maker points you to a star, you pay attention. Not surprised at the B5 reference, honestly. A lot of science writers are probably science fiction fans.